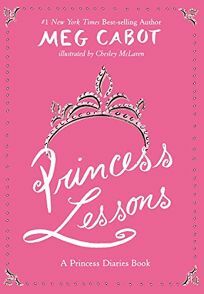 Fans of the Princess Diaries will not want to miss Meg Cabot's Princess Lessons: A Princess Diaries Book, illus. by Chesley McLaren, delivered with the series' signature wicked humor (between the paper-over-board covers in a princessiest of pink volume). From Paolo's ""Pretty Princess"" beauty tips (""I, Paolo, am the one who turned the Principessa Amelia from Ugly Duckling into Swan"") to the Dowager Princess of Genovia's strict rules of etiquette (""Princesses always keep their knees close together when sitting. This is so that the populace gathered before you... does not catch a glimpse of your unmentionables!"") to tips on fashion from Her Royal Highness Princess Mia herself, this masterguide to monarchy will have princesses sprouting up nationwide. McLaren's chic drawings combine fashion flair with fun asides (such as Mia thrusting a booted leg skyward for her grandmother's ""knees together"" pointer).